U.S. states often tussle over who can attract the most innovative, high-growth businesses. Increasingly, governors can point to a new factor that makes their state competitive: affordable renewable energy. Advanced Energy Economy cites that nearly half of Fortune 500 companies have a sustainability or renewable energy target; 22 have committed to 100 percent renewable energy. These companies include Walmart, General Motors, Amazon and others who have also signed on to the Corporate Renewable Energy Buyers’ Principles. That said, not all states are created equal in their ability to provide corporations with the renewable energy they want at the scale they need. A report this month from Retail Industry Leaders Association (RILA) and Information Technology Industry Council (ITI) ranks all 50 U.S. states based on 15 indicators for how easily companies can purchase renewable energy to power their operations. The top five states were Iowa, Illinois, New Jersey, California and Texas. The report notes that the “structure of a state’s electricity market can directly influence where corporations choose to invest in renewable projects.” Overall, states with deregulated electricity markets earned higher rankings because companies in those states had “retail choice,” meaning customers can choose which energy provider supplies their electricity. States with regulated markets, where a monopoly utility provides power to all customers and chooses the source of this power, may initially appear limited. However, the rankings concluded that even fully regulated states can succeed in offering large-scale renewable energy to big customers. Iowa is a regulated state and still came out on top. Green tariffs are one option states with regulated markets can pursue to provide renewable energy to corporations. A green tariff is a large-scale purchasing program where customers can work with their utility to source up to 100 percent of their electricity from renewable resources through a fixed rate. There are now 10 green tariff programs in operation across the United States responsible for approximately 450 megawatts (MW) of new renewable energy production. This renewable power avoids an estimated 554,000 metric tons of CO2 annually, the equivalent of taking almost 118,000 vehicles off the road each year. Virginia and New Mexico exemplify how states in regulated markets can utilize renewable energy options to attract big business. Amazon Web Services (AWS) has several data centers in Virginia. Although AWS can directly enter into independent contracts with renewable energy facilities in Virginia, the company must then sell this energy onto the electric power market—in this case PJM—rather than consume it. AWS’s data centers must source their power from Dominion Virginia Power (DVP), the state’s retail electric utility. Recognizing that the energy supply of these data centers was essential to achieving AWS’s commitment to source 100 percent renewable energy, the company approached Dominion seeking options. In collaboration with AWS, Dominion created an alternative to their existing green tariff, Schedule RG, and proposed an improved option, a market-based electricity rate known as Schedule MBR. 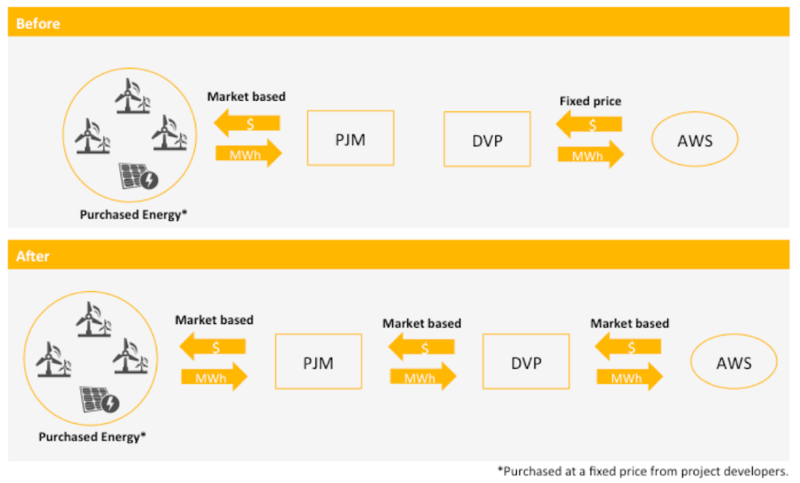 While Schedule MBR can be used to access any energy from the PJM market, the intent was to provide more access to renewables. With its approval last September, AWS was able to enter into five new solar farm agreements. These solar farm deals will generate 180 MW hours of new solar power, enough energy to supply more than 36,000 U.S. homes in a year. Schedule MBR establishes a mechanism for customers to access the type of fuel source they desire. This mechanism is sought by other regulated utilities, many of which are looking to create a similar market-based product. New Mexico is also responding to the growing corporate demand for renewable energy. Last year, Facebook approached utilities in two different states, asking each to provide a product that that would supply a 2017 planned data center with 100 percent renewable energy. Public Service Company of New Mexico (PNM) quickly responded, creating the state’s first green tariff, the Green Energy Rider. By using the Green Energy Rider, PNM will procure an initial amount of 30 MW of solar energy from independent facilities to service the data center. PNM will eventually ensure enough renewable energy sources are acquired to meet the data center’s 110 MW average daily load. According to PNM’s application, this data center will also attract an initial capital investment of more than $250 million and create 4,000 – 5,000 jobs. In a Facebook post celebrating the deal, Governor Susana Martinez said coordination between utilities and government could attract businesses to New Mexico. “By working together at all levels of government, and with private partners like PNM, we have helped make New Mexico a home for one of the largest tech companies in the world,” she said. Edison Energy reports that 72 percent of large companies headquartered in the United States are actively pursuing additional renewable energy purchases. For the foreseeable future, these large companies will continue to buy a substantial portion of their power from their local utility. States with regulated markets will need to be creative and flexible in order to retain and attract this business. Utilities, regulators and large customers must continue to work together to make renewable energy procurement easy and affordable. Check out the Corporate Renewable Energy Strategy map, which highlights these opportunities as they emerge.